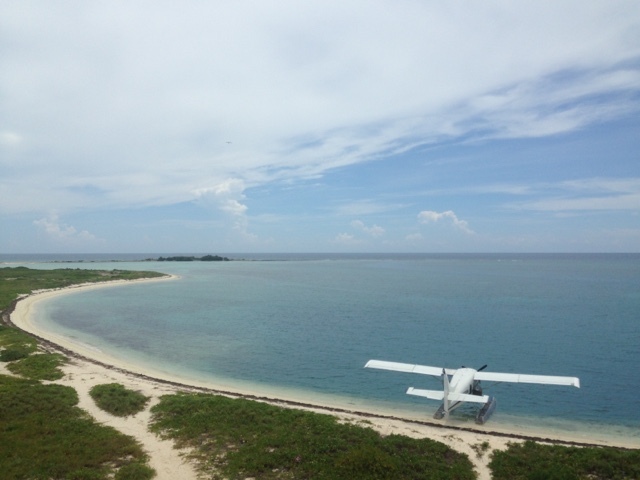 Have you heard about Dry Tortugas National Park? Four weeks ago I had not. When I stumbled upon it on google maps it immediately went to the top of my bucket list. 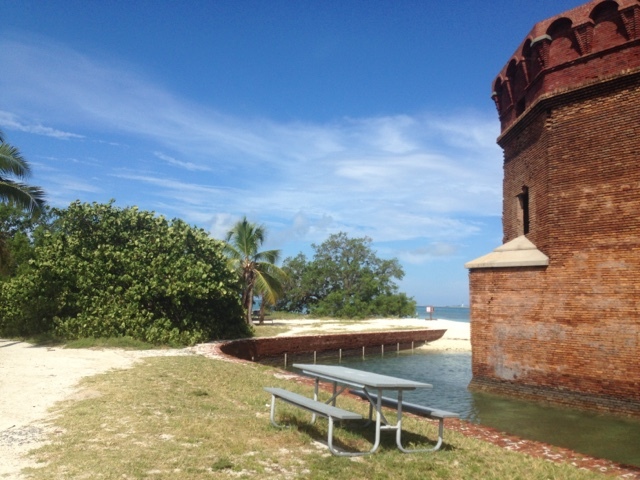 In commemoration for the centennial birthday of the U.S. National Park Service I will be telling you about my experience camping at Dry Tortugas National Park. 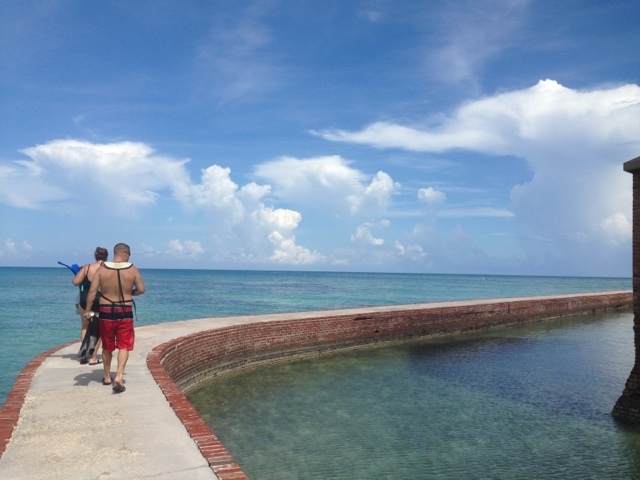 Dry Tortugas National Park is located 67 miles from Key West Florida. 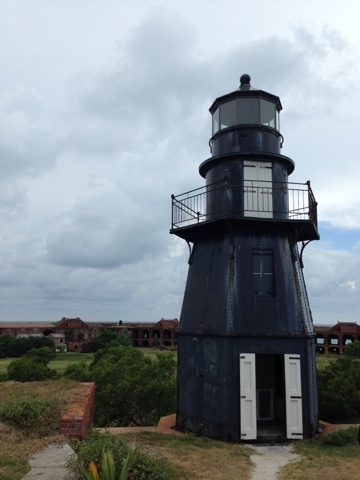 It's a small remote cluster of islands that is home to Fort Jefferson, built in 1846, to protect the U.S. From the gulf. Most of the fort walls still stand today giving the island an interesting lure for tourists. 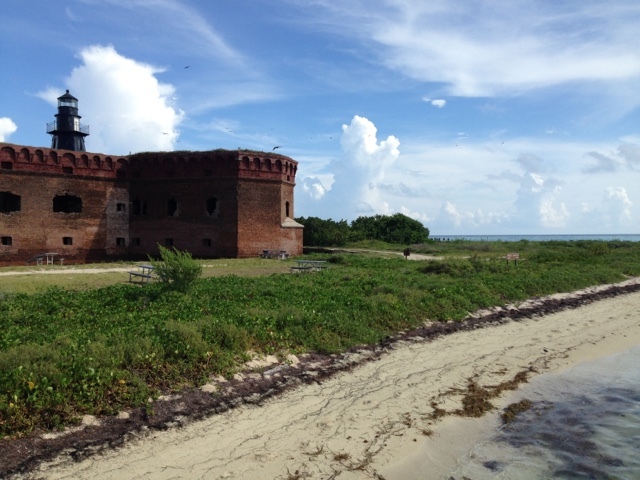 This hexagon shaped brick fort with two story high walls takes up the majority of Garden Island, the most popular of the Dry Tortuga Islands. 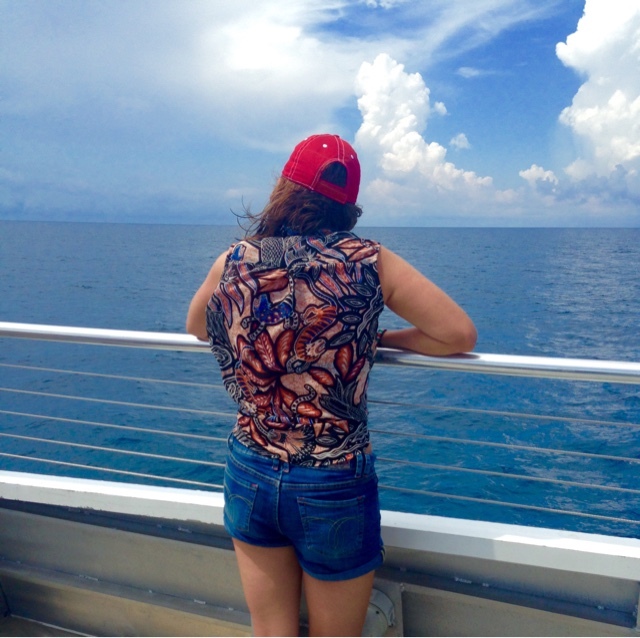 As you approach the islands, it's red brick walls and it's perfect polygonal shape, contrast from the other islands passed on the two hour journey from key west. 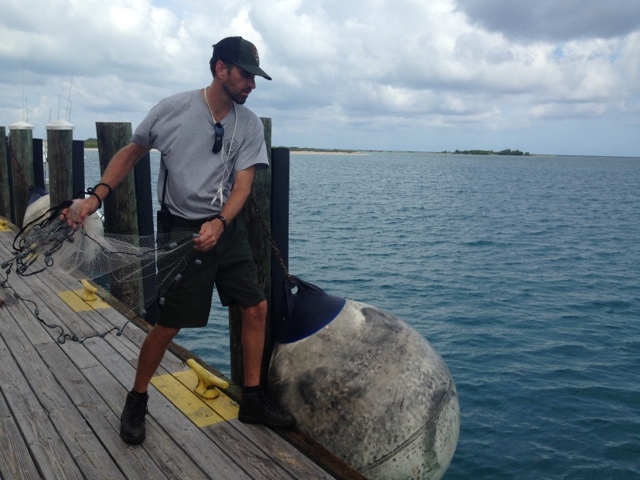 There are many ways to get to Dry Tortugas National Park. You can sail your own boat, you can hire a seat on the pontoon, or you can use the cheapest option; the daily ferry. You can choose between a single day trip or a multi-day trip. Single day trips leave at 8am and return around 5:30pm. Of course when I heard there was camping on the island, I could not imagine a better way to learn and explore Dry Tortugas National Park. When the 175 people board the ferry at 3pm back to Key West, the island is left to the handful of campers, the private boaters and the park rangers. This gives campers the feeling that they are on a deserted island. Immediately when I disembarked the boat I made my way the the most prime real estate to pitch my tent. 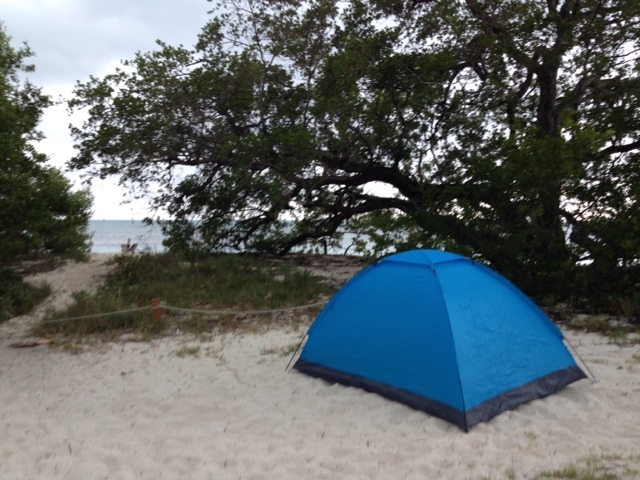 I erected my tent ten strides from the beach behind a gnarly tree furthest from the other camping sites. Seconds after I threw my bags into the tent it began to pour. As there was not much else to do I ran out into the water. I floated near the beach watching bolts of lightning strike the sea around me. As the rain began to calm I decided to try snorkeling. I headed to the north beach and swam out into hundreds of thousands of small fish. Large tarpon swam by eating the small fish. After I walked over to south beach and swam through the pilings of an old ruined dock. Here the posts had been covered by coral and many colorful fish swam in and out of the posts. Swimmers are warned to stay far from the coral, as most of the pilings were covered with fire coral, which stings if you touch it. As I swam back to shore I saw a large dark fish swimming towards me on the sea bottom which was only 3 meters down. The large dark grey fish turned out to be a shark. I tried to stay calm as I watched the 6 foot long shark swim only meters from me. Quickly I swam back, checking once to make sure I was not being followed. When I reached shore I realized everyone had left. The the island was quiet now. Storm clouds loomed in every direction. I began exploring the fort, walking through the parade grounds, climbing the walls, and inspecting the cannons. I was intersected by a ranger who asked if I wanted to catch some dinner. Other than a veggie dog, I didn't have much to eat, so I agreed and followed him and the other four campers to the dock. The park ranger showed us how to cast a circle net to collect bait fish. I practiced a couple time but wasn't very good and the fish were too fast for me. After a couple tries I decided to try my hand at fishing with the bait fish that had already been caught. I threaded the circle hook through the small bait fish and cast out the line of the hand fishing reel. The ranger sad it was like fishing in an aquarium because there were so many fish. I didn't have much luck. The smart snappers were just stealing my fish right off the hook. I was getting hungry. I cashed out the line one more time. When I felt the tug, I released my line a bit. The line still felt heavy so I began to reel it back in. Something tugged at my line as I pulled. I watched in astonishment when I hauled in a foot long snapper. This was the second fish I have ever caught, the first was the piranha in the Amazon. The ranger taught us how to clean, gut, and fillet the fish. I wrapped my fish in foil and took it back to my campsite to cook. That night I feasted on snapper and veggie dogs. 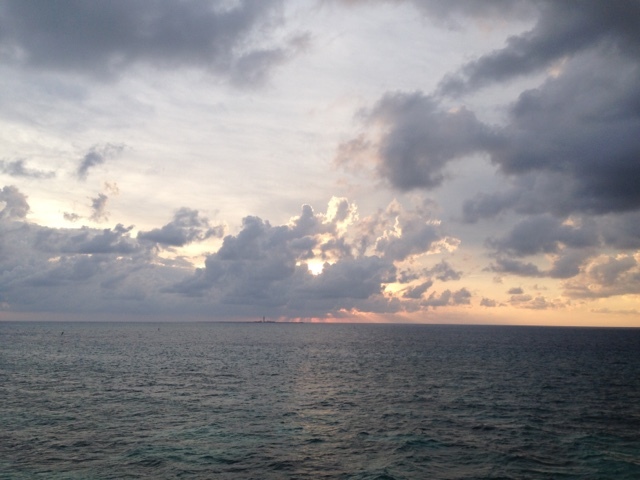 I hauled my dessert up to the fort ramparts facing west to watch the sunset just as it began to pour. I gave up on my hope to watch the sunset as all could see was the rain in my eyes and the dark clouds blocking the sun. I decided instead to walk around the moat wall the lined the fort. At night, alone, it's a bit scary. Waves turned up by the storm hit the moat wall and sprayed water over the surface. I walked hoping the crocodile that lived on the island would not pop out and scary me. As the storm passed the clouds began to clear. Thousands of stars began to shine over Dry Tortugas National Park. They say on a clear day you can see the arm of the Milky Way, I could begin to see it as I headed to bed. The night was windy, humid, and hot. I am never that comfortable sleeping on a small camp mat, adding all the other elements made it very difficult to fall asleep. Once I did, I didn't want to wake up. That morning I packed my bag and I set it out to be picked up by that day's ferry. It was the 100th birthday of the U.S. National Park Services so they had a special treat for visitors. After a flag raising ceremony and cutting of a huge cake, they had reenactments of what it was like living on Dry Tortugas so long ago. I then headed out with the other campers to snorkel. The visibility on both sides of the island was poor and there were more jellyfish so we gave up and decided to tour the fort. As I walked around the fort again I bumped into a friend I had made at Key West. We decided to try snorkeling one more time. We went back to the piling and it had cleared up a bunch. There were still jelly fish, but they were not the dangerous ones. We got out of the water just in time to board the boat back to Key West. I slept half of the boat ride back, the rocking of the boat was soothing and I was very tired. 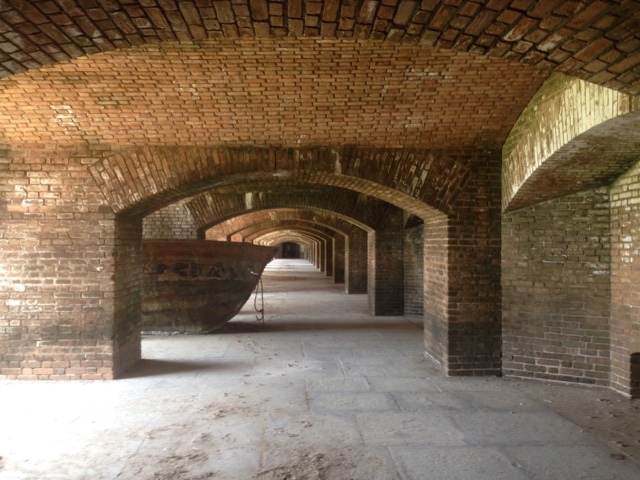 Overall Dry Tortugas was a great experience. It's definitely one of those places you got to do at least once. I have always supported the National Park Service, so it was great to spends its 100th birthday on Dry Tortuga. Maybe one day I will be back, hopefully with my own boat. There are very less national parks who have such good maintenance and beauty covered with natural atmosphere everywhere. This is really a good place to be! 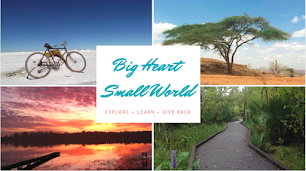 So beautiful park , I have never seen such beautiful and enough long park as a national park .